I have lodged bike racers for the Tour of Walla Walla for many years now. I say “yes” to whomever I am sent. A women’s team from Vancouver, never-raced before-guys from Boise, a National Canadian Triathlon winner, a family from Montana with young teens and two years ago an over 50’s group of guys. This year I hosted orange socks. 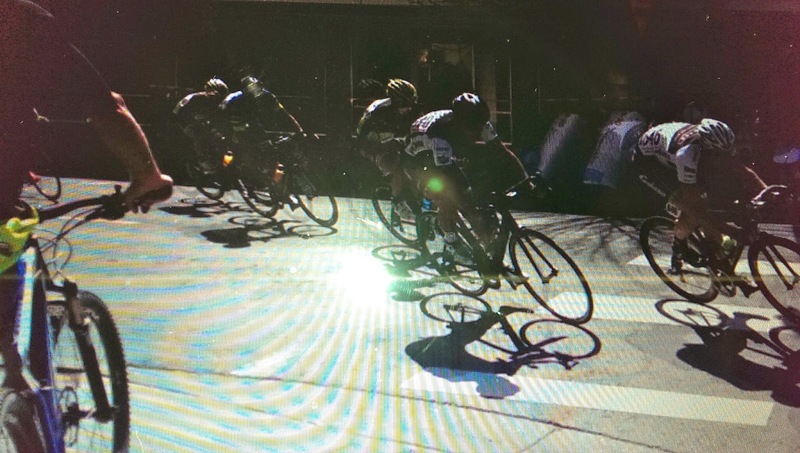 The Tour of Walla Walla has road races through the rolling Palouse hills and a criterion race around downtown. 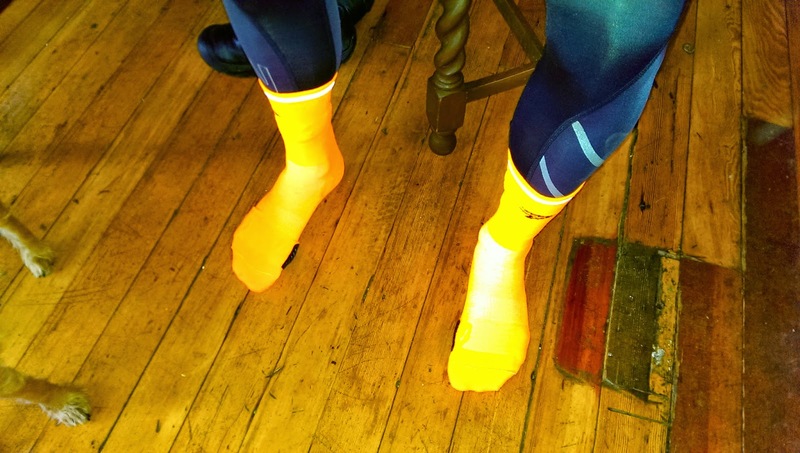 My guest this year, Paul from Eugene, solved the problem of my finding him in his Men's Pro 1 and 2 Class of one hundred and five racers by wearing his orange night glow socks. I counted the racers as they passed and stopped counting at the orange socks. As the race began, I tested the sock theory. On the first swing around the course, he passed in the position of the 34th racer, then 23rd on the next, then 6th and once in 1st place. I took my neighbor, Judi, to watch. She would exclaim over and over, “They are so fast!” We watched until I said, "One more round." And then we stayed for many more. My refrigerator always fills when racers come to stay at the house. They bring their special foods. Good luck foods. As much could be written about food for racers, as is written about the races themselves. Paul was no exception. I won’t divulge his secrets, but food matters. At the end of day of racing, maybe eighty or so miles for the hill races, carbs make the menu. One year I made a dinner for a group of bicyclists. A young teenage Canadian looked with consternation at my pot of chicken and dumplings. All white lumpy things floating in a thickness of brown gravy. He had ridden earlier in the day for twenty minutes at twenty-five miles per hour on our notoriously bad city streets, rounding corners and hoping no crashes would appear ahead of him; his expression of fear of having to eat my dinner seemed to me to be in congruent. However, one bite of the free range chicken and the melt-in-the-mouth dumplings, he piled his plate and had seconds. In his first race season he had conquered fears of racing and dumplings. Admirable. Each year there has been a good story. Once there was a young first-time racer. He was in the bathroom as the road race started. He had missed the call to the line over the crowd noise and the patter from the announcer, but he came in first anyway. Proving that life can start well even on empty. Contestants from Montana would arrive happy to have snowless roads and instant spring. Marshall, a kid who returned for a few years from Missoula, would always request the bed upstairs by the long window. The one in which he woke to a swath of greening leaves, as if waking in a tree house. He would set his trainer bike up by the stream in the backyard. The spring seemed to give him a boost. He was a good racer and got better each year. Racers brought their bikes inside for the night. 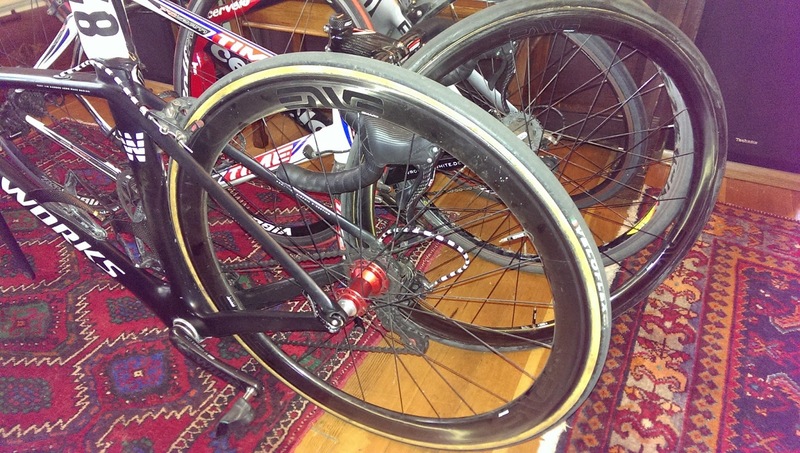 I have grown to love bikes parked on Persian rugs. And even more loved having bike guests. Paul and his wife, Vikki, were especially delightful this year. I hope that Paul keeps racing. (He came in fifth overall.) Come back, you two, and park on my Persians.